Firstly I would say, please don’t look to treat nervous patients if it does not genuinely interest you. We all know that for every patient there is the right dentist somewhere. So if you are certain treating very nervous and phobic patients is not for you, please don’t read any further. Equally if you are looking for a few ideas of what has worked for me and my team over more years than we now care to count, please read on. The list is not meant to be exhaustive by any manner of means and is more a collection of thoughts. This is a real old chestnut in dentistry, we all know that running exactly to time is exceedingly difficult but arriving for a first appointment and having to sit around for ages waiting is every nervous patient’s nightmare. So if possible set up your practice systems so that new patients coming to see you who are nervous are identified in advance and wherever possible offer a time slot where you are most likely to be on time. For example, the first appointment of the day, after a break or after lunch. It is true that you only get one chance to make a good first impression. There are many ways of doing this including simply walking out to your waiting room, introducing yourself to your patient and making polite chat on the way to the surgery. At Craigentinny, our Nurses are very much part of the whole care process and act as advocates for their patients. So they will call the patient from the seating area, say Hi X my name is y and I will be looking after you today when you meet Dr Z. On the way to the surgery their nurse will make a little polite chat with the patient and quietly let them know that if there is anything that they need she is there for them. On entering the surgery, the patient’s nurse then introduces the dentist. This way the patient feels supported the whole way and hopefully does not feel so intimidated when walking into the surgery with the dentist for the first time. Do we see what our patients see? When you work in an environment every day you become blind to how it actually looks. So why not walk out of your surgery right now, clear your mind and walk back in again with curious eyes. What do you see? Is there a lot of clutter, scary dental stuff lying around? A nervous patient is quite likely to assume that everything that they see out on a worktop is for use on / with them. While this is not the case why not remove that doubt for them by clearing the work surfaces as far as you possibly can. Keeping trays on instruments out of line of sight is another important step. Give the patient as much control as possible, e. g. most patients will expect to be ushered straight into your chair, why not tell them they are welcome to choose whichever seat they feel most comfortable in. Most will choose the one in the corner of the room as far away from the dental chair as possible. But at least now the patient will have retreated to where they feel safest in the room, which is a great place to start your conversation. Wherever possible keep the conversation flowing with questions. You really need to listen harder than ever before to the patient as they tell you their story, in it will be all the clues you need to help them, their fears, their triggers, and what things you need to find a way around to stop from scaring them half to death. By asking questions you are showing that you are interested in what the patient has to say and as such are more likely to act on it. Resist the temptation to jump in with solutions as they come to mind, just take notes and let the patient talk out all of their fears. After we are all talked out I usually ask if the patient feels up to letting me look at their teeth, if they prefer to be upright or lying back etc etc. By offering choices all they way you will build trust rapidly. We all know that it is almost impossible to do a thorough examination with a patient sitting upright, but if that is where someone feels able to start lets go. It is fine to be honest and explain to your patient that you can’t see everything as clearly as you would like with them sitting upright. But done nicely and positively it creates a basis of working towards the ideal situation where ultimately your patient will let you tip the chair back in the traditional manner. By reaching out and demonstrating that you are willing to respond to their needs and be flexible along the way, you will continue to build trust and confidence. A few words about the “stop sign”, we all tell our patients about this but you absolutely must respond to it. If you are beavering away and your nurse spots even a waver of a finger, she needs to tell you to stop right away to check where your patient is at. Making sure you have chatted to your nurse to make it entirely clear that she is empowered to stop you at any point is critical, especially with newer team members. Be warned that if you fail to respond to the stop sign, then all trust will be instantly lost and you will have a very difficult treatment session. It is worth mentioning that sometimes you have to just stop anyway. If you sense that the patient is in any kind of discomfort however mild, stop and remind them that it is ok to raise a hand at any time. Remember that some patients have fears or histories that prevent them from actually doing this even if you give them permission. So respond to a raised hand immediately but don’t rely on it. It is important to develop a basis on which you and your patient can work together. Right up front I think it is important to tell patients that if you work together in a spirit of mutual co-operation then it is highly likely that you will be able to help them. You must however manage their expectations that while you are a committed professional and will do anything in your power to help, it will not all be plain sailing. Explain in advance that there will be some visits where your patient feels that they have taken a huge step forwards and they may have other visits where they feel disappointed in themselves for not being able to make more progress. Remind them that any progress is good and that anything that you try together that does not work is still progress as you have identified something that they would prefer to avoid in future. Truth and honesty need to pervade every aspect of your working relationship, so before doing any treatment at all, it is important to manage expectations and explain that so long as you both agree that overall progress is being made, good and less good visits will be a part of it. A follow up call after a visit never does any harm either. Nervous patients need active care and attention 100% of the time. As the dentist you are dealing with what treatment you are doing for the patient, what materials you need etc and managing your patients emotional state too. Recognise that it is difficult to give 100% of your attention 100% of the time. Make it easy on yourself by making sure that everything is set up in advance and that your nurse is totally supportive and on board with helping nervous patients. Your nurse’s job is to support you and the patient throughout the process. If for any reason you need to take your focus away from the patient, your nurse seamlessly will take over. That way between the two of you someone always has 100% of their attention focussed on the patient and how they are doing. We train our team to look at things like how the patient is coping overall, how are they looking pale / florid , what is their breathing like, are they showing signs of a panic response, are their hands relaxed or tightly clenched etc etc. Some patients like to know nothing about what you are doing, others want to know every little step. Either way you have got to talk, communication is at the very heart of helping the nervous patient relax and feel ok with the situation. Choose your words really carefully, reframe any part of the process that you know will stress them out. E. g. Anaesthetic is not injected, we simply let it soak in r—e—a—-l—l—y slowly – sounds a heck of a lot less threatening and if it is pain free then it will boost the patient’s confidence in your skills. If the patient does not want to know anything about the technicalities that is fine, but make sure you still chat to them throughout. Ok, actually why don’t you distract me just a little then. Music, video, chat whatever it is but preferably something that is inclusive and everyone in the room can participate in. A patient with a walkman turned up full blast is very isolated, in their own world where their imagination can run wild and can’t hear any of your soothing words. Why not hook their iPod up to your speakers and play their choice of music. It is important to provide guidance on this in advance, as it is known that even if they love heavy metal this will not lower their blood pressure or aid relaxation. Make frequent breaks part of your routine. Even if you don’t think the patient needs it, stop to offer a rinse, a chance to sit up and move around is always welcome. These offers help to convey your constant concern for the patients’ well-being and show that it is dentistry on their terms not yours. Even if it feels excessive your nervous patients will thank you. Finally recognise that working with nervous patients who have recently joined your practice can be seriously hard work. But, like so many things in life, by giving first without expecting to receive, you will be pleasantly surprised when your early efforts are repaid. And if you help a patient overcome their fear you have a patient for life and someone who is very likely to tell their friends about your care. It is critical that every nervous patient receives your very best efforts. Caring for this group of patients is, in my experience, massively rewarding as you see another human being overcome what was previously an insurmountable problem in their life. It is truly wonderful to see the personal growth that often follows when someone resolves a long standing dental fear. Equally recognise that in helping, your clinical and communication skills will be tested to their limit. 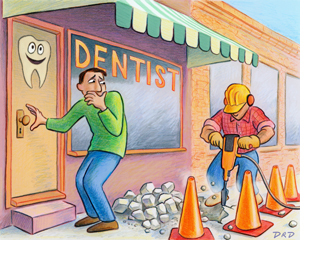 The early visits in particular can be emotionally draining for both patient and dentist. As such it is wise to try and manage your workflow to control the number of very anxious new patients that you are working with at any one time. Parenting Fridays: Πόνος, βήχας, πυρετός; Θαυμάσια!..